A beautiful little market town and fortunately the people of Llandeilo know it and appreciate it. The streets are lined with delicatessens, shops and cafés giving you plenty of places to eat, drink and shop. In keeping with its heritage, Llandeilo has retained many small independent shops. Big name high street stores may be few and far between, but there is a wide choice of businesses: kitchenware, ladies’ fashion, hardware, dressmaking, jewellers, ﬂorists, art galleries and antiques. Our personal favourites are Rosetta‘s coffee shop and eaterie and Heavenly; an artisan chocolate and ice cream shop. Also, the Gin haus Deli has newly opened in Llandeilo for all those gin lovers. There’s an outdoor market every Friday, and once a month, you’ll ﬁnd an Antiques Fair and auction. This splendid mansion, also known as Plas Dinefwr (Dinefwr Mansion), was built by Edward Rice in 1660. The ‘hands-on‘ Newton House gives visitors an atmospheric circa 1912 experience. Inside its entrance hall, is a fabulous original 17th century staircase winding its way up to the exhibition room on the first floor of the house. The ceiling and walls display fabulous artwork and portraits of many members of the Rice family. The house is now in the hands of the National Trust, making it accessible to all. Lying just east of the town centre, it is a striking monument settled into the South Wales countryside. Dinefwr Castle has been the seat of Lord Dinefwr since his family first acquired the site through Roderick the Great in the 9th century. Today a picturesque 18th-century landscaped park surrounds Newton House, which was 17th-century but now has a Victorian Gothic facade. Dinefwr Park is home to more than 100 fallow deer and a small herd of White Park Cattle. It also has a number of scenic walks including a wooded boardwalk. Never ceases to amaze. There are few castles in Wales which can boast a more spectacular location. its stout, weather beaten ruins crown a sheer limestone crag overlooking the remote Black Mountain (Mynydd Du) and the River Cennen in the western corner of the Brecon Beacons National Park, around four miles southeast of Llandeilo. An attack on‘ the castle must have been a daunting prospect. Ingeniously adapted to its rocky hilltop, its core is a high walled, strongly towered enclosure, protected by a succession of pits, drawbridges and gatehouses. Approach from the other direction is impossible, for the castle tiptoes on the edge of a sheer 100m cliff. Has over 8,000 plants decorating 560 acres of countryside. The Gardens have a comprehensive programme of activities and plantings change throughout the season with occasionally rare ﬂowerings of exotic plants that attract attention from around the world. The main attraction is The Glasshouse, a huge glass-domed structure in the heart of the gardens, which houses many plants from warmer environs. It is partly built below ground level and the roof contains 785 panes of glass. Have been the inspiration to poets and artists for nearly 550 years and in the last century, photographers too. It has been described without favour as the ﬁnest “garden in Wales, so deserving of its heritage garden of excellence label. Contains sixty acres of excellent wooded parkland surrounding a magnificent mansion, although the mansion is not open to the public. A secret place with its own herd of fallow deer Gelli Aur Country Park is set in 40 acres of historic woodland that has been sensitively managed over more than 500 years. It boasts a remarkable selection of specimen trees including a towering and rare sequoia. Is a dammed lake to the west of the Black Mountain range in the Brecon Beacons National Park in Carmarthenshire, South Wales. The Beacon’s Way National Trail passes close by the lake and the path offers ﬁne views of both the lake and the Brecon Beacon’s National Park. A folklore legend connected with Llyn y Fan Fach is the myth of “The lady of the lake”. 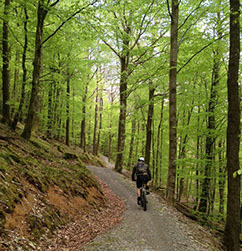 Mountain bikers enjoy the Brechfa Forest mountain bike trails near Abergorlech. Brechfa Forest is a mixture of ancient forest and managed woodlands containing mountain bike trails as well as promoted walks and rides. Waterfall Country (or sometimes Waterfalls Country) is the name given to an area around the head of the Vale of Neath in South Wales where an unusually large number of spectacular and publicly accessible falls are to be found. Take a walk through stunning scenic woodlands to visit 4 impressive waterfalls including Sgwd Clun-Gwyn, Sgwd lsaf Clun-Gwyn, Sgwd y Pannwr and Sgwd-yr-Eira. As you walk towards Sgwd Clun-Gwyn, listen out for their thundering roar before you reach them. Four Falls Trail can be started from Gwaun Hepste Car Park in Brecon Beacons Waterfalls which is part of Brecon Beacons National Park Forests. Ystradfellte is the nearest town or village. Sgwd Clun-Gwyn — the ‘fall of the white meadow’, is actually two sets of falls, a few hundred metres apart. The upper falls are the highest – a broad Niagara with a scarily big drop — the lower fall is a picturesque series of cascades that ﬂow like a magical staircase into a steep gorge. lt’s popular with white-water kayakers and, in summer, canyoning groups. Sgwd y Pannwr — the Welsh name reveals that it was once used for washing wool. Sgwd yr Eira — this is the most photographed of all of the waterfalls, because you can actually walk behind the curtain of thundering water on a rough path used by sheep farmers. Every country in the world has its ‘hidden gems’, but this genuinely deserves the title. It’s a perfect spot, made all the more special because it’s far from any road. There are ten attractions all included in the one entry ticket, and there is plenty to see and do for all ages. (Dan-yr-Ogof Showcaves, Cathedral Cave, Bone Cave, Museum, Mr Morgan’s Farmyard, Dinosaur Park, Iron Age Village, Shire Horse Centre , Barney Owl’s Play Area, The Millennium Stone Circle). The 3 different caves Dan-yr-Ogof, Cathedral Cave and Bone Cave each offering a unique underground experience. In Dan-yr-Ogof you walk through the beautifully decorated passageways for just under 1 kilometre; in Cathedral Cave you walk through its enormous caverns, carved out millions of years ago. and at the end of this cave experience the excitement of walking behind the 40 feet high waterfalls that cascade around you in the ‘Dome of St Paul’s’, an atmospheric end to a truly wonderful cave; and in Bone Cave learn why 42 human skeletons were buried here, and how our ancestors used caves all those years ago. Above ground there is plenty to see and do – come face to face with some of the largest animals ever to walk the Earth in our Dinosaur Park, one of the biggest collections of life-sized dinosaur models in the world! Witness how our ancestors lived during the Iron Age, and enjoy the company of the friendly giants the Shire Horses. Down on the farm, children will have a great time in the covered play areas should there be any excess energy waiting to be used up before the journey home! A sandy beach with rocky outcrops, very popular for swimming, surﬁng and families, and offers summer lifeguard cover. Holds Blue Flag and Seaside Awards. Langland Brasserie overlooks the graceful sweep of Langland Bay. A 2 mile walk from Langland Bay to Caswell bay gives an opportunity to explore two of the Gower’s most scenic bays. Langland is near Mumbles which is famous for both Joe's and Verdi's ice cream. Beside the harbour is this shingle beach with an expanse of sand at low tide, which welcomes sailors, windsurfers, canoeists but has no hire facilities, so take your own! The town is famous for its honey ice cream, which comes in every ﬂavour from gooseberry to ginger, made by the same local family for decades. There are three safe and sandy beaches and a harbour in the small ﬁshing port of New Quay. Harbour beach is particularly pleasant and has golden sands, safe swimming and a lifeguard patrol in the summer. It's also one of the best places in Wales to try spotting bottlenose dolphins, as a pod of 130 reside in the bay and can often be seen playing and hunting.